MLK Jr. Signature Service Days welcomed over 300 students and 171 community volunteers, giving everyone a chance to serve over 25 participating organizations. Conservation Fusion was a proud contributor to this year’s Signature Service Days, hosting several service projects inside of UNO’s Community Engagement Center. In preparation for our upcoming Cold Weather Critters: Coloring for Conservation contest later this February, students created informational posters for each featured organization: Snow Leopard Trust, Red Panda Network, and Wildlife Conservation Society’s Tiger Project. Another group contributed by crafting paper snowflakes for our Cold Weather Critters display that will be featured in UNO’s Community Engagement Center. We also had another several student volunteers working on hand-made bracelets that will be gifted to the children of Madagascar. Our biggest collaborative project, however, was the completion of a community art project for the people of Madagascar. 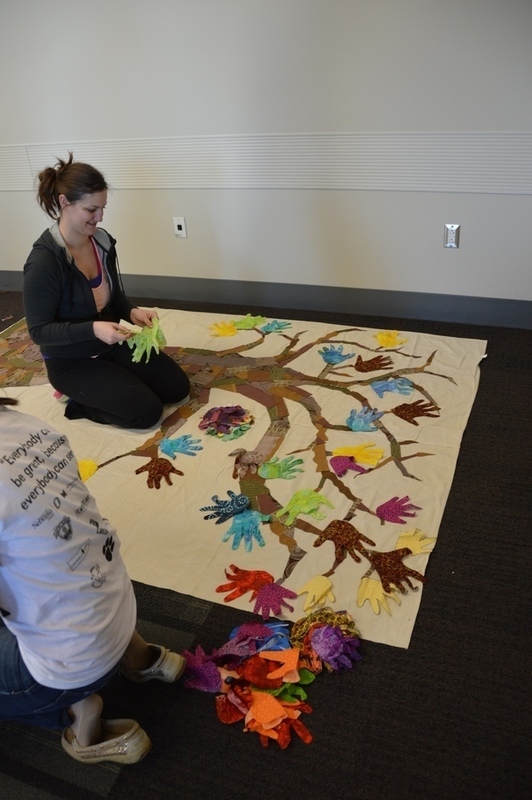 The trunk of a large, quilt-like tree was crafted on a large white sheet out of scraps of brown fabric by three of our student volunteers while a separate volunteer group worked on tracing handprints and cutting them out of colorful fabric. While the trunk of the tree was assembled, we left our handprint “leaves” detached and plan to have community members in Madagascar come together to complete this collaborative art project later on this year. Alex Bauer, Volunteer Connections Coordinator in UNO’s Office of Civil and Social Responsibility, shared with us that “Martin Luther King Jr. dedicated his life to his cause, so I see no better way to commemorate him than through service to others.” We couldn’t agree more and had the most amazing time contributing to Martin Luther King Jr.’s legacy through Signature Service Days. It was a day dedicated to connecting with others and committing to service. For us and for the hundreds of volunteers participating, MLK Jr. Day was definitely not just a day off. Special thanks to the Office of Civil and Social Responsibility for coordinating the MLK Jr. Day service opportunities. And, of course, to all our great volunteers from UNO and from Metropolitan Community College! Well certainly they are doing great job having done all the things which matter most for them as they are doing the best thing here thanks. In my opinion you have done an awesome job for holiday. by the UN. You may call this a sort of bribing. You have raised an important issue..Thanks for sharing..I would like to read more current affairs about UNO Service..keep posting..
A perfect and delightful swimming pool in the lawn is a fantasy of http://www.essayarsenal.co.uk/ proprietors. It is one such extravagant offices where individuals make out time to unwind. Your greatest communitarian venture, be that as it may, was the http://ukdissertationpros.com/ consummation of a group workmanship venture for the general population of Madagascar. Datang dan bertaruh olahraga favorit Anda dan dipercaya perusahaan taruhan pernah. This is extremely good one extremely good example of collaborative work to reaching all corners of the globe with effective work.hat kind of activities really boost or polish the skills of students to grow fast & to learn things in effective manner. Interesting story you have shared it is useful and getting a lot of new thing its really nice and making best cheap canada goose jacket http://www.winterjacketseshop.com/. lots of thanks that may be well-founded what i had been hunting as regards i'm bookmarking this Canada Goose Snow Mantra Parka site http://www.downcoatseshop.com/canada-goose-mens-canada-goose-snow-mantra-parka-c-1_20.html any longer. I also support your idea that instead of sitting idle we all should do some charity work to help and support the deprived children of the society. I will check your different articles quickly. Glorious post! your site Soldes baskets pas cher http://www.soldesrunningfrance.com/ is stunning! I can't stop perusing this article. I feel very glad to read on this topic. Would you mind updating your blog with some more Billige Løbesko Udsalg Danmark http://www.skotilbuddk.com/ , Best work. This is a good post. This post gives truly quality information. I’m definitely going to look into it. Thank you so much. Keep up the good works Kup buty do biegania sklep internetowy http://www.butyskleppl.com/ . Hi dear, its an amazing information for everyone. Thanks a lot. Such a nice post thanks you for information. Nice post for all thanks for sharing. I have visited your web blog first time and I am glad to collect the information that I want to find I have bookmarked it for later Use. I found your website while searching for relevant topic and you got a good point in your article. Keep sharing and keep posting the same as you did. The career and the future of a student depends on the college where they study. Its a serious duty of college to give their best knowledge to student for their career development as well as character build-up too. Superb! This is an excellent creativity. You have a special talent to do something creative. I really like your creative job! Perfect <a href="http://dissertationroom.co.uk/">dissertationroom.co.uk</a>. Best writers and managers will make dissertation just for you.